Here in the USA helmet market, we know about all the usual suspects: pricey, high-quality helmets from Japan and Italy and the more budget-oriented (but often very high-quality) lids from Taiwan, China and South Korea. Where are the offerings from Germany, a nation known for high-end and cutting-edge manufactured goods? In your closet, if you’re one of those matching-suit-wearing BMW riders,you might have an ancient BMW-branded Schuberth “System” helmet from the ’80s or ’90s, which you sometimes wear even if it’s probably no more protective (due to age) than one of those cheese hats Green Bay Packers fans wear. Do not fear—new and old Schuberth fans in the States can now purchase these innovative, comfortable and high-quality helmets, with the new C3 flip-up and S2 full-face model now available. The $699 C3 is older news (and testers have said it’s one of the lightest and quietest flip-ups on the market), but the $699 S2 replaces the S1, which has been on the market since at least 2004. The S2 has some impressive features. The all-new shell design is made from a composite Schuberth calls STRONG, claimed to be lighter and, um, stronger than other composites and fiberglass, and it’s been extensively wind-tunnel tested to be as quiet, well-vented and aerodynamic as possible. It includes an integrated flip-down internal sun visor, patented anti-roll-off system, “turbulators” on the Pinlock-equipped faceshield to smooth airflow, microlock chinstrap clasp and anti-microbial ThermoCool comfort liner. Also interesting is the world’s first built-in dual antenna for FM and Bluetooth reception, designed to work with Schuberth’s $399 SRC Bluetooth communication system (which I’ll test soon). Another cool bonus feature is the Schuberth Mobility Program. If you crash and damage your helmet within three years of buying it, Schuberth will replace it for 1/3rd the original MSRP. Wearing the S2 bears out much of the company’s claims. It is light—not as light as the lightest premium race helmets, but at three pounds, six ounces on the MD scale, it’s as light as any full-face with built-in sun visor I’ve had. Build quality is nice, with superlative fit and finish, even if I didn’t like the feel of the plastic fittings like the vents and faceshield mechanisms. The fit wasn’t quite right for me—I usually fit best in an HJC or Shoei—but that’s not the fault of the helmet! Even if it wasn’t perfect, it was still comfortable and I expect it to get better as it breaks in fully. 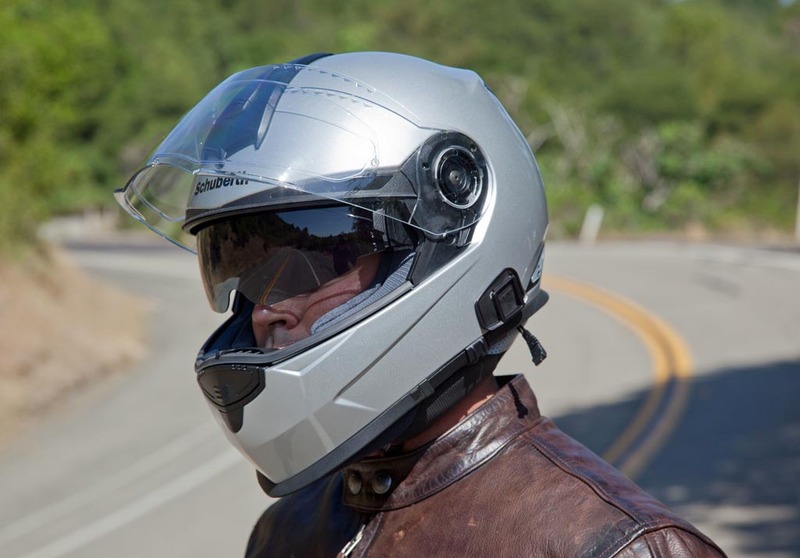 In any case, two things govern a helmet’s comfort—weight and noise levels, and the Schuberth shines in these areas. With the tight-fitting neck collar in place (which does make the helmet harder to don and doff) sound levels were so low I thought I was riding 20 mph slower than I was on a naked bike. However, with the collar removed (which I like to do in warmer weather), it’s only slightly less noisy than other helmets. That calm quiet, combined with the light and well-balanced design, make the Schuberth a good pick for long-distance, high-speed rides. Living with the Schuberth is easy, after you read the lengthy owner’s manual. That helps you figure out how to work the vents, remove and wash the cheekpads and liner, and remove the faceshield (which comes with the excellent PinLock anti-fog insert)…all easy tasks in the end. The venting was also impressive, with airflow felt at legal speeds, something you can’t say about most of the helmets I’ve tested. I also found the faceshield to seal well and I was very impressed by its optical clarity, which was matched by the undistorted vision and ease of use offered by the flip-down sun visor. 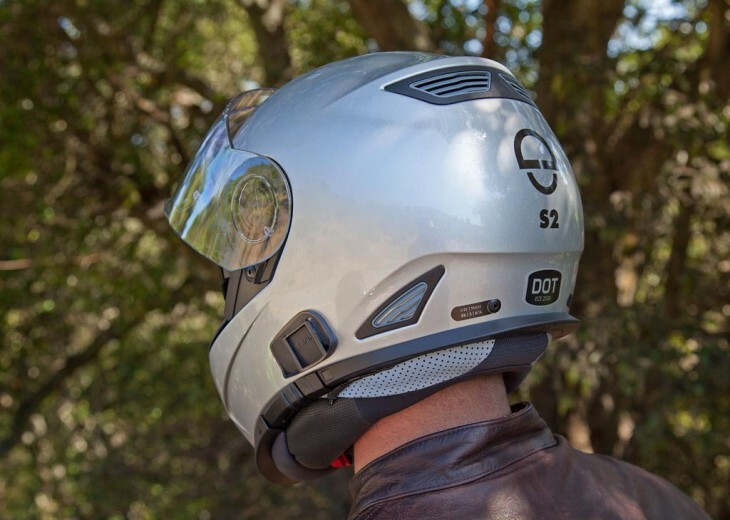 I found the S2 to be a well-engineered and highly functional helmet in every way. Is it worth $699? Sure, there are cheaper helmets that seem like better values to me—but you can say the same about any luxury product. Why buy a BMW when a Honda Accord will get you from here to there just as well? Schuberth has legions of devoted fans, even in a market where they couldn’t even buy its products for some time. These are riders that put tens of thousands of miles on their bikes every year. Maybe they’re just paying for a name—or maybe they know something you don’t. 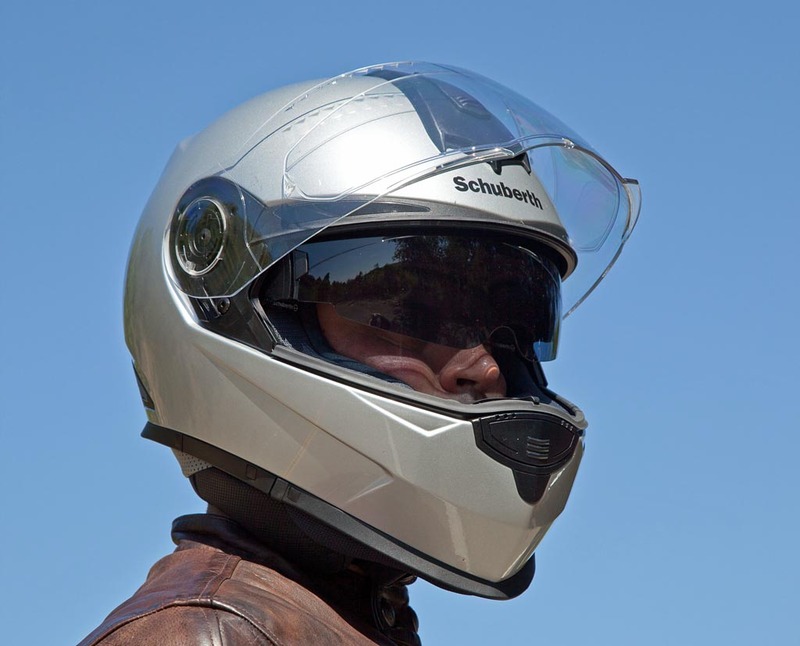 My experience with my Schuberth S2 is that it’s deserving of its high-end reputation, a solid and well-made helmet that will function well through its entire service life. Find out more at Schuberth’s website. Photo note: black object on left side of helmet is mount for a Sena Bluetooth headset and is not included with the Schuberth helmet. I bought a C3 for my girlfriend and I when I got my K1600. Really well-made and the BT system worked nicely with the bike. However, the helmet actually killed our heads. Shape is one thing but the liner is hard as a rock to boot. The customer service rep told me to keep wearing it and it would break in. I’m not sure if he was talking about the helmet or my head. They generously refunded my purchase once my brains started spurting out of my forehead. Once again, it is a beautiful and light and quiet helmet-as good as it gets. But fit and comfort are everything and it didn’t work for me. Quite astonishing, I must say. I would easily change my bike for this helmet. It is just absolutely impressive. Reminds me of Robocop somehow. I wonder if he had a Schuberth helmet, after all. It’s not mentioned in the review, but those long, black, shiny horizontal triangles in the upper eyeport area are actually black reflective tape. They are visible in the second and third photo. The black Schuberth S2 logo on the back is also reflective. It is a special 3M tape that normally looks black, but reflects bright white like normal reflective tape. It is a nice safety feature that is a bit more understated than a fluorescent yellow helmet. A few years ago I purchased Schuberth R1 helmets for my wife and I. I had to import them from Germany, but final cost was only about $350 each. The R1 model was a lighter version of the S1, which is the predecessor to the S2. For me, it replaced an aging Shoei RF800 and the Schuberth has been better in every regard. I will never own another helmet without a flip down sun visor. The prices of these new models seem a bit steep, but I am glad to see Schuberth represented in the US again. Hopefully they will start importing the rest of the model ranges and street prices will be a bit lower. Yes,.. but is it easy to for me to put on my glasses while wearing the helmet? And, can I put on the helmet while wearing my small prescription goggles? I had a a Schubert C1 with the internal visor…..I liked the amount of airflow the helmet flowed with the shield slightly pulled out….the helmet, however, was very loud. The face shield wore out and became nonfunctional very fast. Replacement shields were difficult to find! I replaced the helmet with one from HTC that was purchased on a closeout at approximately 80% less than I had paid for the Schubert. I purchased one for me and my wife. We both concluded that the HTC was a huge upgrade from the Schubert in our comfort and function. We have had the HTC for about 2 years and it continues to perform and exceed my expectations. I have not had to replace anything including the shield in this time frame.There will be no Schubert in my future! I had a Shuberth C1 (I think?) that was the first Flip up helmet, with internal sun visor I ever saw. About 8 years ago, and it was $500. But it also had metal latches for the chin bar (hope the new one is also) and was well made. It was noisy, but everything else about the helmet screamed quality. Luckily, I never had to crash it, but I felt invincible. I wonder about the Pin-lock anti fog system also… My old Schuberth had a coating on the main shield, and it worked fine. After a few years, it was flaking at the edges, like where it hits the seals, or your gloves, but no big deal. Why Pin locks now? Ant the other feature the old guy had was a venting mode that allowed you to flip the main visor all the way down, BUT each side of the visor could be clicked forward about 1mm or so. Just enough to keep the shield off the seals, and get a breeze in the helmet bug time, while keeping bugs and rocks out. You could pop just one side forward, and riding in the rain would keep the rain out (mostly) and never fog up. Summary… Lose the pin-locks, bring back the “venting” of the shield! Believe the model I have is the same as yours. Biggest piece of c### ever. Had the same problem with film falling off the sun visor. The wind protector under the chin started having its coating fall off when it was still fairly new. Worst of all it developed a crack just above the visor for no apparent reason. It was never dropped, and if it was hit by a big rock one would think I would have noticed something like that. Finally, the foam head liner fell apart way too soon. Bottom line, if you want a premium helmet, get a Shoei… Best helmet I’ve ever had, hands down. My $130 KBC is a high quality helmet as well. As someone who went through the BMW ‘System’ (Schuberth) “fad” in the ’80s — sorry Schuberth, not again. I even had a ‘brought-in from Europe’ System 3. Those ‘System’ helmets were poor. I tried one at my local dealer. It is a great product. Unfortunately, if like me you have an oval head, you will find it torturous to wear any longer than 5 minutes. If you are round-headed, it will probably work for you. I bought the new Arai Signet Q which is the most comfortable helmet I have worn in over thirty years of riding. Arai is still the best fitting helmets for oval shaped heads. The price of Schuberth helmets is tough to swallow, but my hearing is invaluable to me. I simply HATE noisy helmets. And although I don’t like a long chinbar obscuring my vision, my big schnoz appreciates the extra room. While I don’t know whether I’ll get an S2 or a C3, I will purchase a Schuberth helmet in the future… just as soon as I save a lot more money. Wow lol someone is bitter…. The Helmet is simply amazing it is one of the quietest, lightest helmets on the market. I have talked on my cell phone commuting to work, and the person on the other line did not know I was riding a bike on the freeway. Plus anyone who does any kind of distance riding know how impotent a quiet, light helmet is that still keeps your head cool. All I have to say is once you place one on your head and you can afford it you will buy it. The helmet is for people who want the best, and the best cost money. Sorry but since i like to remain among the living I think I can skip phone calls while I’m riding. By the way…..do you ride a BMW? why would anyone want to talk on a cell phone while riding? One reason for riding is to get away from the nonsense of constant contact. Of course, safety is the primary issue. Helmets are so important for safety. However, in my opinion they are important is less obvious ways than simple impact situations which both improve safety and raise enjoyment of the sport. Noise reduction is a big area where helmets can improve both. Heightened noise for extended periods of time (like sport tourers experience), can lead to early mental exhaustion and can leave the rider less aware of the situation around them or the road conditions ahead. Ear plugs certainly are huge way to minimize this affect, but a good helmet is like riding in a Cadillac vs. an old pickup with the windows down. The inner visor is an absolute “must have” for virtually anyone who has tried one. This feature alone makes it so easy (particularly for eyeglass wearers) to ride where alternating conditions of shade and sunlight make swapping glasses impractical. So the helmet has to protect in the case of a fall, BUT, it can also help us avoid a fall by keeping us fresh and able to function at the top of the game for longer periods of time. I’ll be buying a Neotec or the C3 sometime this year. Can the chin bar be any larger? That has to be one of the ugliest helmets I’ve ever seen. Plus….Pinlock? With anitfog visors like Scorpion’s-who needs the Pinlock insert? Needless to say this will probably be purchased 99% of the time by BMW riders-who wants to spend $700 (oops,sorry-$699) on an ugly motocross looking helmet with an obscured visor? Pinlocks don’t wash off like most antifog coatings do?